The in-game sprite of Devil from Devil World. The Devil (デビル, Devil) (called Demon on the British version of the Smash Bros. DOJO!!) 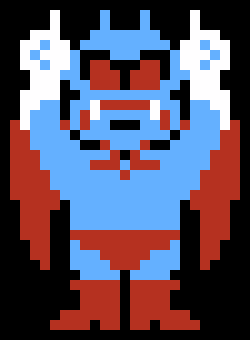 is the villain in the NES game Devil World, developed by Shigeru Miyamoto, which was released for the Japanese Famicom and PAL NES systems only. Devil moving the walls in Devil World. The Devil acts as the villain and main hazard in Devil World, where he tries to thwart the efforts of the heroic dragon Tamagon to destroy him and seal Devil World away for eternity. 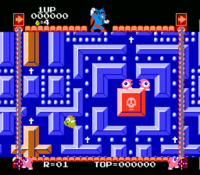 He appears in every non-bonus level at the top of the screen, pointing in various directions in order to make the walls of the current game area shift around the level, thus limiting the player's movement to a small window of the full maze. When a stage is cleared, the Devil recoils, turns into a bat and flies away. The Devil was mentioned in the description of the Tamagon trophy as "a large, winged demon". This trophy was only available legitimately in the Japanese version of Melee. When released, the Devil appears as a bat, flies to the top of the screen and turns into his humanoid form. He the starts pointing in various directions, accompanied by an 8-bit sound from his source game: this causes the screen to scroll in the opposite direction, effectively altering the offscreen boundaries of the stage. The effect is great enough that it can leave just a small section of a stage, e.g. Battlefield, remaining. When playing in Pirate Ship, it is also possible for the entire stage to be moved offscreen. This also allows for more camera control freedom when the game is paused. After a short while, the Devil disappears in a puff of smoke and the screen turns back to normal. A devil who wields serious power in Devil World. In the game, the devil floats above the maze and commands by pointing. When it gives orders, its cyclopean minions turn cranks that scroll the maze in different directions. When Tamagon, your character in the game, places all the stage's books into a hole, the devil turns into a bat and flies away. It's quite striking, no? The NTSC version of Brawl lists the game as 'Japan Only' in error. The PAL version corrects this. The Devil in Smash 4. The Devil returns from Brawl, his function completely unchanged, allowing the player to see beyond the camera boundaries of many new stages. However, one slight change was made to Devil in Smash 4. Certain moves such as Flip Jump can now connect with Devil, proving that he has a hurtbox, despite being immune to the effects of attacks. The Devil trophy appears in both versions. In Super Smash Bros. for Wii U it is part of the NES Trophy Box. Devil's trophy in Super Smash Bros. for Nintendo 3DS. Devil's trophy in Super Smash Bros. for Wii U.
: A devil who holds absolute authority in Devil World. When he appears, he'll fly into the sky as a bat and then transform into his devil form. He'll then begin to point frantically in different directions, scrolling the stage where he points. You're...not really helping things, buddy. : A devil who appears to hold absolute power in Devil World. In bat form, it flies to its perch, then turns back into a devil and begins waving frantic orders to make the screen scroll all different ways. Considering that it's an assist trophy, it's not doing much in the way of assisting. The Devil returns as an Assist Trophy. Training Mode describes his Assist Trophy: Moves the stage in whichever direction he points. Can't be KO'd. Official artwork of Devil from Brawl. Devil in Super Smash Bros. for Nintendo 3DS. Devil as an Assist Trophy in Ultimate. With his debut on October 1984, Devil is the oldest Assist Trophy in Super Smash Bros. Brawl. 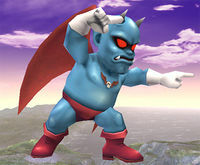 Devil is the only Assist Trophy from a non-playable universe who is a villain in his home series. If the Devil is summoned during fixed camera mode, the stage won't be moved. Devil cannot be summoned in 63 stages in Super Smash Bros. Ultimate, making him the most limited Assist Trophy in Ultimate. This page was last edited on February 18, 2019, at 12:03.